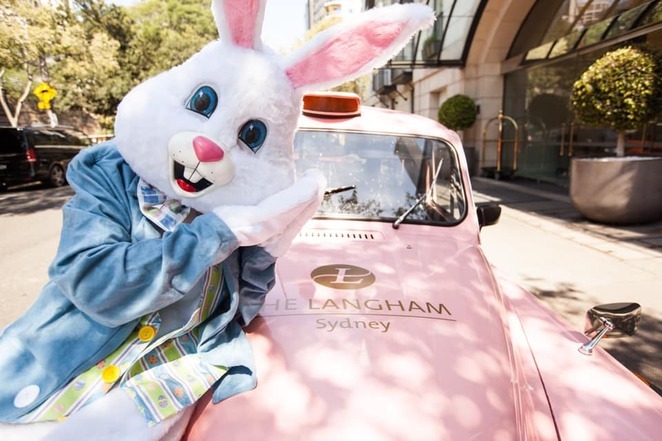 Easter is an egg-cellent time to celebrate with family and friends and many of Sydney's finest establishments are putting on themed high teas around the holiday that will have you drooling long after they're over. The Cortile dining area of the Intercontinental Hotel is putting on two high tea options – one is a chocolate-infused buffet and, the other, a traditional high tea stand full of carefully-crafted chocolate creations. The buffet includes a range of savoury treats, as well as sweet delights in creamy chocolate & pistachio choux rabbits, chocolate macarons, almond & yuzu tarts, orange crepes, cookies, warm chocolate hot cross buns with lashings of butter, a candy station, and so much more with various times available on Good Friday, Easter Monday and weekends throughout April. The high tea stand includes many of the above items and way more than the average 3-tier stand you'll find elsewhere. It's available weekdays from 11am-4pm. A glass of sparkling wine or a mocktail on arrival is also included in each option as are a selection of Ronnefeldt loose leaf teas. The Lobby Lounge of the Shangri-La Hotel has been transformed into a magical garden full of whimsical delights, thanks to executive pastry chef Anna Polyviou. 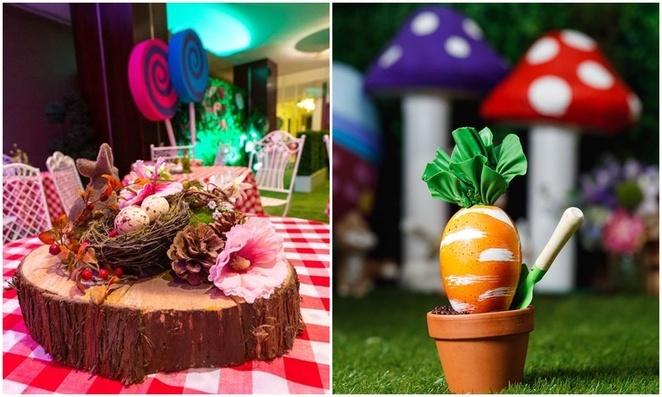 Everything from cracked eggs of mango compote and sticky hot cross buns with hazelnut spread to decadent chocolate pots with edible rock soil, a club cake and Mrs Whippy ice cream, will have you on a sugar high. Savoury items of quiche, cheese & crackers, a roast chicken roll with coleslaw and more, will balance it out. For adults, there's also boozy refreshments that include a Vodka Spritz, a popcorn caramel Martini and a traditional flute of bubbly. Fall down the rabbit hole with sessions running 3 times daily– 11am-12.45pm, 1pm-3pm and 3.15pm-5pm. A rabbit warren of sweet and savoury heaven is being presented at The Langham with a greeting from Mr Rabbit himself, along with an Easter gift and colouring-in activities for the little bunnies. Delectable sweet items include carrot and ginger edible garden beds, golden egg bonbons, hot cross bun macaroons, Mr Rabbit tartlets, mandarin & white chocolate eggs, plus more, whilst savoury items include the likes of beef & potato pie, mushroom & cheese puffs, tuna & caviar tartlets, and finger sandwiches. Two sessions are available – 12pm-2.30pm and 3pm-5.30pm. One of many offerings in April, the high tea experience on Easter Sunday is sure to be a hit in the beautiful surroundings of The Atrium within The Grounds of Alexandria. Not only does this revitalized area provide great food, they provide styling that is second to none. 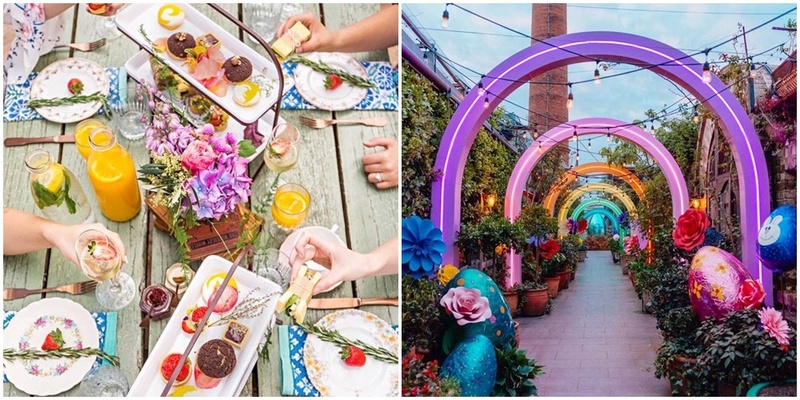 Picture delicate tea cups, tiered stands of delicious sweet and savoury items adjacent to a rainbow laneway installation and a giant Easter egg where you can participate in cracking it (first in, best dressed basis). The menu includes cured beef sandwiches with Russian slaw, Coronation chicken on Brioche toast, smoked trout tartlets, mini raspberry pavlovas, chocolate & coconut 'bounty bars' to name just some of the items, whilst a separate children's menu includes jaffles, fluffy buttermilk pancakes with berries and mango hedgehogs with yoghurt. Sparkling wine is part of the deal for adults as is tea and coffee, plus orange juice for the kids. Three timeslots are available – 11am-12.30pm, 1pm-2.30pm & 3.30pm-5pm, with a minimum of 2 people required. 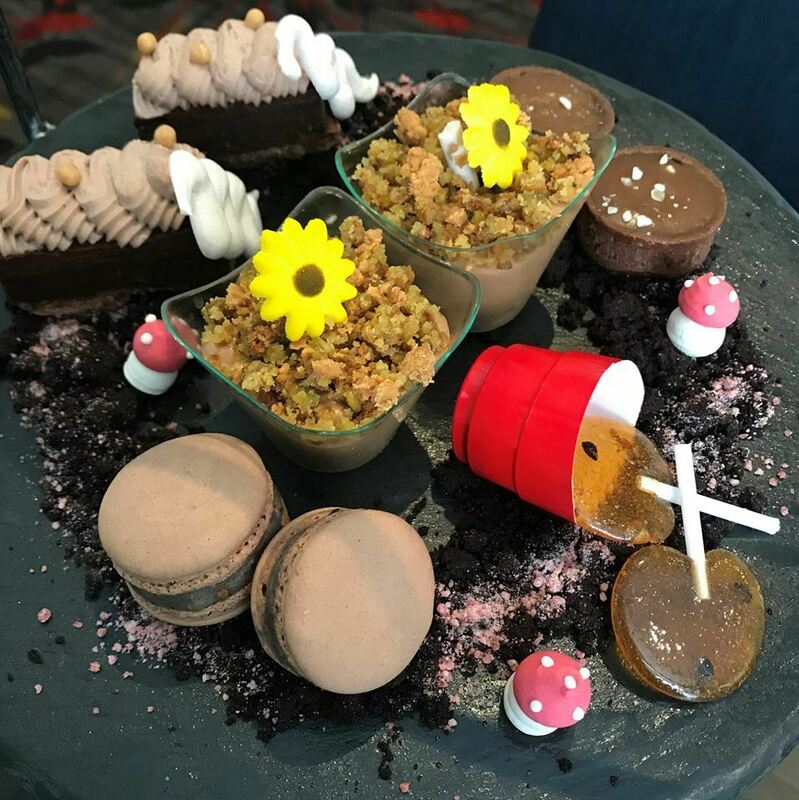 This garden-themed buffet in the Crossroads Bar at Swissotel features a high tea for the whole family with free-flowing sparkling wine for adults and a playful dining experience for the kids that comprises a cookie decorating station and face painting. The delicious items include chicken & avocado pinwheels, prawn Marie Rose with pineapple on sourdough, smoked salmon & fennel bagels with lemon ricotta, quiche Lorraine, house-made sausage rolls with tomato chutney, Easter rocky road, profiteroles with hazelnut cream & mocha glaze, vanilla cups with rooftop honey & peanut brittle, assorted cupcakes, rhubarb & apple crumb, a chocolate fountain with churros, marshmallows & fresh fruit, and more. It's all on from 12.30pm-3.30pm, with pre-payment essential. This afternoon tea in the Lobby Bar of the Mosaic Restaurant at the Westin Hotel has been around for a while and has not been specifically created for Easter but it is worth mentioning because of its theme which sets it apart from your regular high teas. Tempting you under the stunning glass atrium are 3 options. You can choose just the savoury menu for $54 that includes items called Tweedledee and Tweedledum, that's roasted beef & asparagus roulade on mini laugen Caterpillars, cherry bocconcini & tomato on fresh green salad boats Alice in Wonderland and Spanner crabmeat salad on double bread wrapped in cucumber, all with a tea or coffee. You can then add sweet to the above for an extra $10 and get a 'Drink Me!' cocktail and dessert that sees you indulging in The Mad Hatter's Hat of rich dark chocolate mud cake encased in icing, The White Rabbit's pocket watch purple macaroon with a blueberry cream filling and The Queen of Hearts with layers of raspberry buttercream, chocolate ganache and raspberry jelly. Add another $10 to all of the above and you get your royal treat with a flute of R de Ruinart Champagne plus scones with jams and clotted cream. Wow, that's mad and you can choose various times. 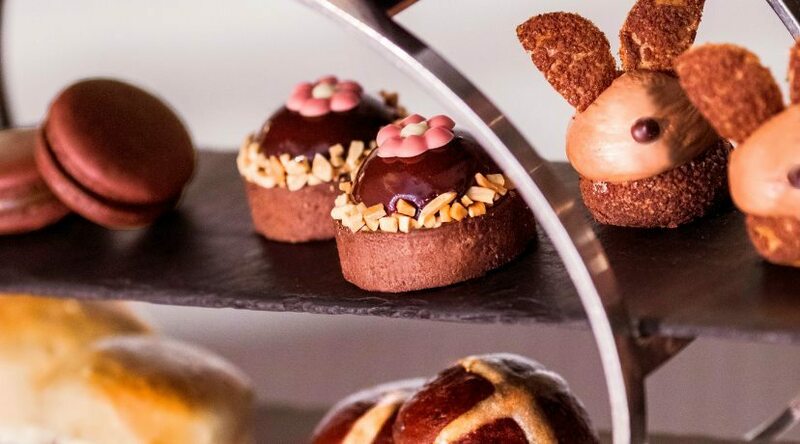 To coincide with the Charlie and The Chocolate Factory musical, the Radisson Blu Plaza Hotel is putting on a high tea over Easter and the school holidays with lots of treats for children and adults alike. Inspired by Willy Wonka, the pastry chef has specifically designed a quirky and egg-citing chocolate spread to accompany some tasty savoury items. Tea, coffee or hot chocolate are included and with all high tea orders, you will receive a Golden Ticket for a chance to win a Mother's Day High Tea. 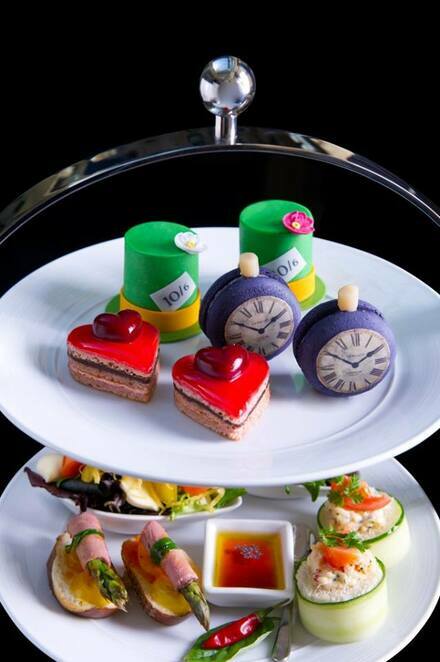 Times to indulge in are from 10.30am-4.30pm. There's lots of great options in the above list, so hop into Easter and let the eggs-purts take care of your desires. Congratulations on winning second place. Congrats on your 2nd in the comp, Irenke - well deserved! Well done on the Silver! 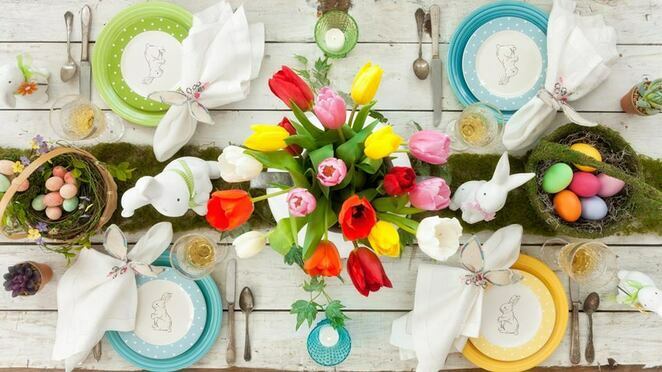 I've never thought of an Easter high tea Irenke.